Same but Different? New Zealand through Aussie Eyes . . .
Jenny and I had a delightful holiday in New Zealand recently. While we only toured the North Island we certainly enjoyed our encounter with New Zealand and Maori culture. Geographically New Zealand sits on top of the meeting of the Pacific and Indo-Australian continental plates and it is this that accounts for the amazing volcanic and thermal activity across the middle of the island. 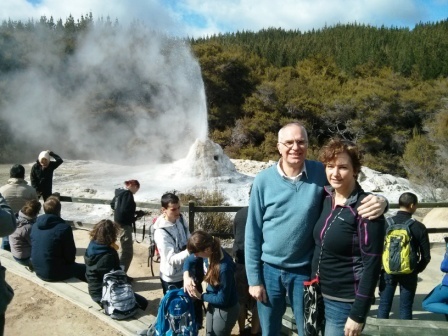 We thoroughly enjoyed the boiling mud pools, the sulphur pools, and the geysers. New Zealand has a different beauty to Australia, although the rolling green hills often reminded us of Tasmania. The stunning beauty of the snow-capped mountains wonderfully displayed . . .